Salient CEO Ryan Brown, pictured with CTO Brian Adams at Velocity, called the university's lawsuit 'beyond the pale' because UW previously encouraged the startup to commercialize the very technology it is now suing to obtain for itself. The University of Waterloo is at war with a startup housed on its premises that is staffed by alumni and students, funded by the school and trying to commercialize a clean-energy technology invented on campus. UW, one of Canada’s top science and technology universities, has sued Salient Energy, a six-person firm based at Velocity Garage incubator, asking the Ontario Superior Court to declare the university the sole owner of patented intellectual property (IP) now held by Salient so UW can instead license its use to one of its funders, the U.S. Department of Energy’s (DOE) Argonne National Laboratory. The university alleges in court documents that Salient “wrongly misappropriated UW’s business opportunities” and engaged in “malicious and high-handed conduct … [showing] reckless disregard for UW’s rights.” It is asking for $600,000 in damages. It could be the nastiest IP battle to hit since Waterloo, Ont., NTP Inc. successfully sued Research in Motion Ltd. for patent infringement in the early 2000s, nearly resulting in a shutdown of its BlackBerry service in the U.S. It also puts UW in an awkward position: The school brands itself as an innovator-friendly institution and supporter of the Canadian technology sector, yet it is suing one of its own in order to benefit a foreign government. “For a school that claims to be committed to entrepreneurship and innovation, it is simply out of character,” Mr. Brown said. It’s also the kind of dispute that, while rare, could become more common as Ottawa pushes domestic innovators to take their IP to market, experts say. The UW/Salient dispute dates back to early 2015, when then-PhD student Brian Adams and postdoctoral fellow Dipan Kundu worked in the lab of chemistry professor Linda Nazar – an officer of the Order of Canada who holds a Canada research chair in solid-state energy materials. Her lab has received $1.1-million from the DOE’s Joint Center for Energy Storage Research (JCESR) since 2013 to develop battery technologies. Over the course of several days in late April, 2015, Dr. Adams and Dr. Kundu conceived of their invention and put the first prototype to work. It was a breakthrough: a rechargeable water-based zinc-ion battery that could store power longer and more safely than standard lithium-ion batteries. It would be cheaper to make because the raw materials were less expensive and the manufacturing process would be simpler. Dr. Nazar disclosed the invention to the university on May 28, 2015, identifying herself as the “principal investigator” and the researchers as co-inventors. At the suggestion of the school’s technology commercialization office, she disclosed the invention had been partly funded by the DOE contract. That was done in error as she moved hastily to file the disclosure, she later told university officials – and it would factor in the dispute. Staff from the office helped her apply for a provisional patent listing the trio as co-inventors, but offered them a choice: They could sign over their IP rights to UW or patent and commercialize their invention themselves. The trio, together with Mr. Brown – then Dr. Nazar’s lab assistant – decided to strike out on their own and create Salient. They figured the batteries would be perfect for producers of intermittent solar and wind power to store energy so they could more steadily feed it into the electricity grid, making alternative energy more feasible. 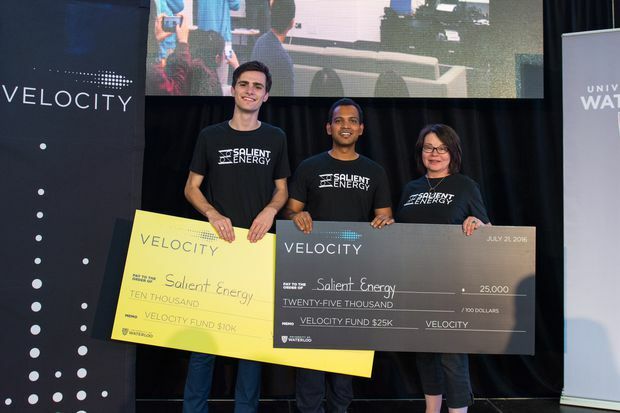 Salient Energy CEO Ryan Brown, University of Waterloo post-doctoral student Dipan Kundu and chemistry professor Linda Nazar (left to right), sporting company t-shirts, were all smiles in July 2016 as they accepted $35,000 and entry for their startup into the university’s Velocity Garage incubator to commercialize clean energy technology developed in Dr. Nazar’s lab. But relations between the would-be founding team and the university soon fell apart, leading to a lawsuit and patent dispute between UW and Salient this year. There was a problem, however. According to school policy, on-campus researchers retain full rights to their IP, not UW – except when outside organizations underwrite the research. In those cases, IP rights are negotiated between UW and the sponsor. This has been a lucrative source of funding, providing $231.3-million to UW for sponsored research in the past five years. Under the JCESR deal that underwrote Dr. Nazar’s lab, UW was to own any IP resulting from that funding – but the U.S. agency retained the right to license it. A few weeks before the Velocity competition, a JCESR official told them he believed their invention was indeed funded by the agency. If so, that meant the invention belonged to UW and JCESR retained the licensing rights. The Salient team disagreed. They dug into their files and UW payment records to show neither researcher had received JCESR funding during the invention period – even though Dr. Nazar had disclosed otherwise. Dr. Nazar wrote to Mike Szarka, UW’s director of research partnerships in late June, 2016, asking – in one of several internal e-mails obtained by The Globe – that he push back on JCESR as a result of that error. But Mr. Szarka replied that “from [UW’s] point of view, I am not highly motivated to pursue this.” To argue JCESR hadn’t funded the IP – contrary to the original filing – represented “at best … a steep uphill battle, and at worst carries the risk of a lengthy dispute or reputation cost” to UW, he wrote. The school wasn’t going to press Salient’s case and suggested it license the IP instead; Dr. Nazar agreed it would be a tough fight. The interests of the school and the startup diverged further as Salient’s principals dug into UW’s IP policy. It stated that researchers who did sponsored work had to provide “informed consent” to give up their IP rights. Those consent agreements had to be approved by specific UW officials including the associate provost of graduate students who were supposed to ensure students knew about the policy. Salient and Dr. Adams (a co-defendant in UW’s lawsuit) argue in court documents none of the officials mandated by UW policy ever referred Dr. Adams to policies or documents affecting his IP ownership, nor gave him anything to sign away his rights with informed consent – which would mean he was a rightful owner. After hiring IP law firm Bereskin & Parr LLP, the Salient team concluded that because Dr. Kundu and Dr. Adams owed nothing to JCESR, Salient could have access to the IP if either assigned their rights to the company. A complex situation was about to get messier. After initially pledging to split ownership of Salient equally four ways between Dr. Nazar, Mr. Brown and the two researchers, the would-be founders couldn’t agree on terms. They enlisted senior university officials to mediate, but by mid-December, 2016, they still hadn’t reached an agreement. So only Mr. Brown and Dr. Adams became Salient owners and employees, parting ways with the other two. Velocity required Salient’s “participants” to assign relevant IP rights to the firm to receive their prize money; only Dr. Adams did so. UW filed its lawsuit this past June, then petitioned the U.S. patent trial and appeal board to invalidate the granted patent because it omitted Dr. Nazar as an inventor. UW claims in the petition that the invention was “conceived jointly” by the trio and that Dr. Nazar contributed “invaluable guidance and direction” without which the discovery “would not be possible.” In her declaration supporting her inventorship claim, Dr. Nazar states she was “extensively involved” in “directing, supporting, reviewing and communicating” with the researchers. She also claims to have had “substantive discussions” with Dr. Kundu that he would then relay to Dr. Adams. “As such Dr. Adams might not have known explicitly whether ideas and concepts came from me or Dr. Kundu,” she said. Salient has not responded. The defendants counter that because of school policy on informed consent and Velocity’s instructions for Dr. Adams to assign his IP claims to Salient, that UW has “waived any rights to bring this action.” UW “was aware of, consented to and … required the defendants” to transfer the IP from Dr. Adams to Salient, it states. Dr. Kundu didn’t reply to a request for comment and Dr. Nazar deferred comment to the university. Editor’s note: An earlier version of this story stated the University of Waterloo's law firm demanded Mr. Brown sign over his IP rights to UW. This version has been corrected to state it was Dr. Adams, not Mr. Brown.